Perfectly sweet with just a touch of heat Bam Bam Pomegranate Jam is delicious topping off bread & butter or your favorite PB&J. 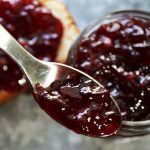 I use jam to make delicious homemade salad dressings too - it's so versatile! Juice the pomegranates. You'll need 3 1/2 cups of juice. Depending on the size of the poms, you'll need about three. Measure out exactly 3 1/2 cups. Clean the raspberries mash them well. You'll need exactly 1 cup. Place jars, rings and lids into a pan, cover with water, bring to a boil and boil for three minutes to sterlilize, keep warm. In a heavy stock pot, place the pomegranate juice, raspberries, chili powder, chili flakes, salt & butter (if using). Mix everything together well. Measure ¼ cup of sugar and mix it with the contents of the Low Sugar Sure-Jell. Sprinkle it into the pomegranate/raspberries mixture. Mix well again and set it on the stove on high and bring to a boil, stirring constantly. When it comes to a hard boil (a hard boil is one you can't stir down with spoon) add the remaining sugar. Continue stirring constantly and return it to a boil and when it comes back to a hard boil, continue boiling it for exactly one minute. (Set a timer to make sure you get it for a full minute). Remove from the stove & immediately ladle into sterilized jars. Place lids on jars, screw on tightly. Process in a hot bath (boiling water) for 10 minutes to seal the jars. The seeds of the raspberries rise to the top of the jars. If you want to spread the seeds thru-out the jar, flip them over every 20 minutes for about an hour. As the jam begins to set & jell the seeds will be distributed thru-out the entire jar, rather than just at the top. Makes 6-7 eight oz. jars.